It’s time to get into the swing of holiday shopping! You are likely surrounded by ads and emails urging you to hit the stores or jump online to get the perfect gift! Not to stress you out even more but I’m going to add one more challenge – or maybe just think of it as a friendly reminder – can you shop AND be eco-friendly too? If you’re like me you are probably shopping for gifts by both making trips to the mall and ordering online. So which one is the more eco-friendly option? And will the answer change your buying habits? An article published in March 2016 in the Wall Street Journal cites a study that suggests driving to and shopping at a mall may have a lower environmental impact than ordering online. The reasoning is that mall shoppers often travel in groups and buy more than one item, reducing their environmental impact. Online shoppers, meanwhile, return products more often, and the shipping requires more packaging. Hmmmm…that theory also makes sense too! By now you have hopefully adopted the habit of grocery shopping with reusable bags and have ditched plastic bags. Well, those reusable bags don’t have to be limited to just carryng bread, eggs and milk, right? 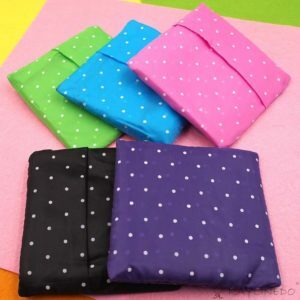 You can use those same reusable bags to carry scarves, Xbox games and ties! Simply let the store clerk know that you brought your own bag – no need for a plastic or paper one from the store! You may get some strange looks, especially if you don’t live in area where there is a plastic bag tax, but don’t let that deter you!! You are doing the right thing – it may have never even ocurred to the store clerk that there was an alternative to using the store’s bag! If you’re hesitant to drag your large grocery totes (that may have some food debris left in them!) into the mall, pick up a few of these adorable, foldable nylon shopping bags. The bags pictured are from Amazon but I’ve also seen them at The Container Store and even at my local grocery store. A few of them will fit right in your purse when not in use and are easy to whip out and fill with gifts! In addition to skipping the store shopping bag you can also feel free to pass on the extra tissue paper or other extra wrapping some stores insist on wrapping even non-breakable items in. Honestly, you just don’t need it! Your online order is likely to come packaged in a box or large envelope along with packing materials inside. 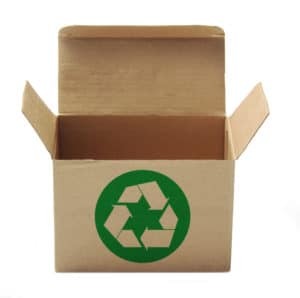 Unless you are just going to wrap that shipping box up and gift it you should make sure you are disposing of all that packaging in an environmentally friendly way. Plastic packaging like bubble wrap or air pillows (inflated bags) can both be recycled with your other plastic bags and plastic film at your local drop off location. Also recyclable through plastic bag/film drop off are plastic shipping envelopes, including Tyvek. Paper envelopes without padding are recyclable in your paper bin and are reusable. Paper envelopes with plastic padding are definitely reusable but not likely recyclable. Cardboard boxes are reusable AND recyclable so pick one and do it! Just don’t put them in the trash!! Maybe a friend or neighbor can use them to ship a gift?! Other packing materials like styrofoam blocks or peanuts are, sadly, not recyclable. 🙁 However, there are some peanuts that are biodegradable and disolve in water. Before you dump peanuts into the trash try running one under water to see if it may not be styrofoam after all. And before dumping styrofoam packaging in the trash see if a neighbor or friend can reuse them! 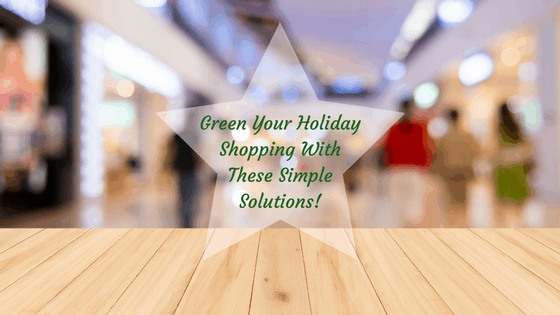 There you have it…some seriously simple ways to green your holiday shopping! Notice I didn’t ask you to consolidate shopping trips or map out your route to most efficiently use fuel – although those would be great to do as well! 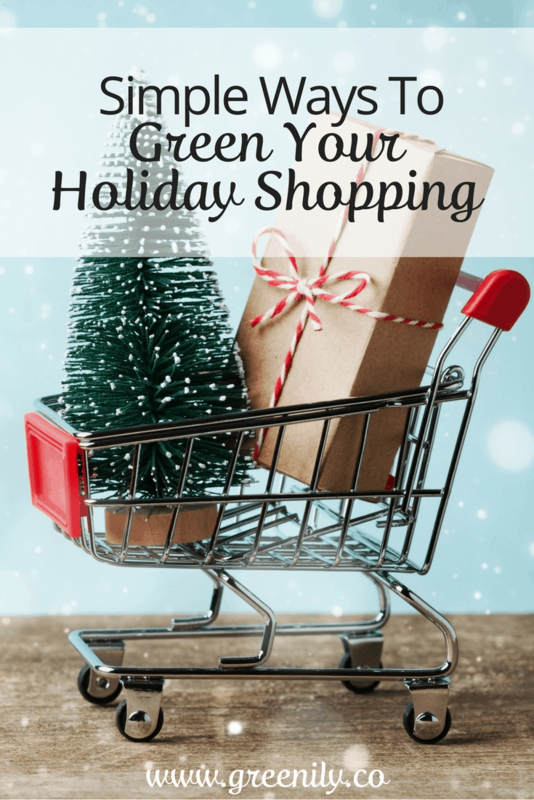 All I’m asking is that you take on a few simple solutions that can and will make a difference in greening your holiday shopping! It’s really that easy…it’s your family only greener!